As an Italian-American, and as a native of Connecticut, if there is one thing that I judge the most when it comes to food: pizza. I grew up just 15 minutes from New Haven, Conn. where places like Pepe’s, Sally’s and Modern Pizza set the bar for my pizza tastes. So it was evident when I moved out to Los Angeles just over three years ago I wouldn’t be indulging in late night Dominos and Pizza Hut runs. Recently I found a good substitute to quench my pizza thirst while I am away from my Connecticut roots. Trader Joe’s sells pizza dough and last weekend while my boyfriend’s family was over to decorate for Halloween I decided to make some pizza rolls as a little snack for everyone’s hard work. Here is the recipe. Preheat oven to 400⁰. Place dough on lightly floured surface and let sit for 15 minutes. 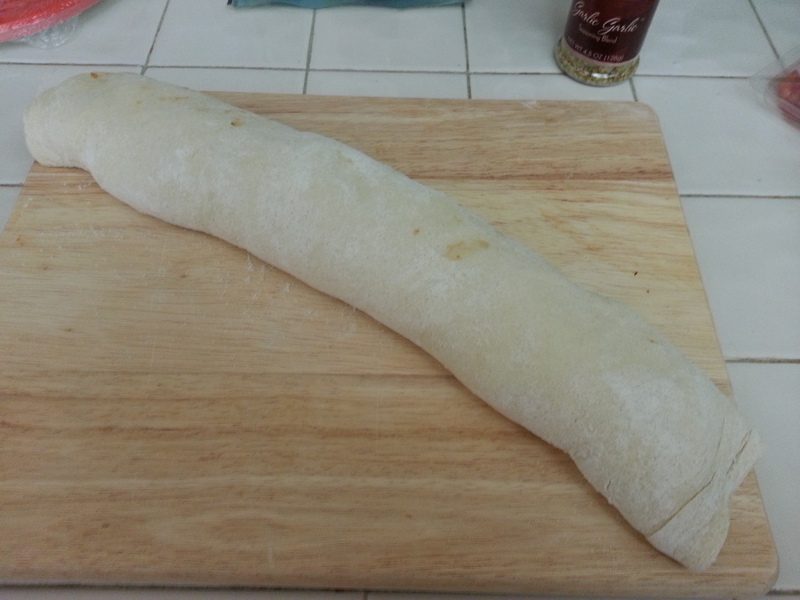 Roll dough to about 1/8 inch thick layer. Spread marinara sauce over dough leaving ½ inch at the top of dough for easier rolling later on. Add oregano and garlic evenly over sauce and top with mozerella. Layer pepperoni over cheese and gently roll dough toward the bare ½ inch of dough. 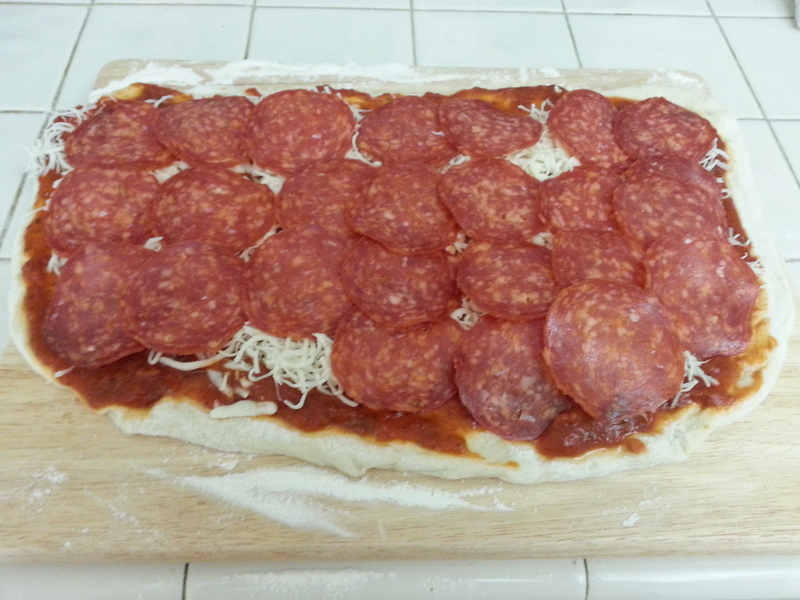 Place rolled pizza onto floured cutting board with the seam side down. Place in refrigerator for 30 minutes. Spray baking sheet with cooking spray. Remove and cut log into 1 inch pieces. Dip one side of pinwheels into cornmeal and place, cornmeal side down, onto baking sheet. Top each pinwheel with Parmesan and bake for 15-20 minutes. When cooking is halfway complete, spin pinwheels for even cooking. 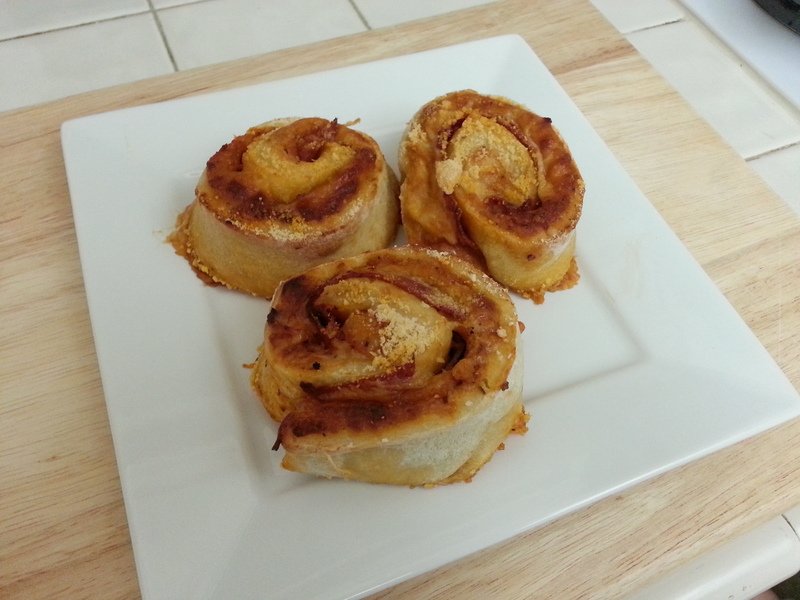 Serve with heated marinara sauce dripped on top of pinwheel. Pizza dough before rolled into pinwheels. Don’t forget to leave an inch at the top of the dough to ensure a mess-free roll. Pizza log that goes into the refrigerator to sit for approximately a half hour.